In large bowl, stir biscuit mix, water and oil until soft dough forms; beat vigorously 20 strokes. Let stand 8 minutes. Move oven rack to lowest position. Heat oven to 450 degrees. Grease 12-inch pizza pan with shortening or cooking spray. Press dough on bottom and 1 inch over side of pizza pan. Place string cheese along edge of dough. Fold 1 inch edge of dough over and around cheese; press to seal. Bake 7 minutes. Spread tomato paste over crust. Top with onion, bell pepper, mushrooms, pepperoni and olives. Sprinkle with mozzarella cheese. Bake 8 to 10 minutes or until crust is golden brown and cheese is melted. Slice into 8 pieces. Serve with parmesan cheese and crushed red peppers. You can make this with different meats (instead of pepperoni) but make sure they are fully cooked before baking. Preheat oven to 375 degrees. Spray a 13 x 9 inch pan with cooking spray. This pizza bakes best in a glass pan. In a medium bowl, mix together biscuit mix and milk until a soft dough forms. Drop half the dough by spoonfuls across the bottom of the pan. It won’t completely cover the bottom of the pan, just make sure the piles of dough are even across the bottom of the pan. Pour half the sauce over the piles of dough. Scatter half the pepperoni over the sauce. Top that with half the cheese. Repeat the above pattern with the remaining dough, sauce, pepperoni and cheese. Bake for 20 – 25 minutes or until golden brown. Feeds 8. My kids are crazy for this!! For those of you that don’t know, a calzone is basically a pizza inside of it’s crust. There are so many different combinations I decided to give you the basic calzone recipe and then some suggestions after. Use your imagination! Spray a cookie sheet with non-stick spray. Lay the dough out flat on cookie sheet (the dough is square when it is unrolled). Spread desired sauce to within ½ inch of edge. Don’t spread it all the way to the edge or your calzone won’t seal. Sprinkle about ¼ tsp parmesan into center. Fill half the calzone with desired fillings. Top the filling with mozzarella cheese. Fold the unfilled half over the filled half and press down on edges to seal all the way around the calzone. GENTLY press down on the top of the calzone to flatten it a little. Spread a small amount of olive oil mixed with Italian seasoning over the top. Cut three small slits in the top to release heat. Bake in a 400 degree oven for about 7 minutes or until crust is brown and cheese is melted. Garlic butter – Mix a little garlic powder with butter. Heat to dip, cold to fill. Marinara – Mix tomato paste, a few drops of water & Italian seasoning. Heat to dip, cold to fill. Breakfast calzone – Use ranch dressing as the sauce inside. Use scrambled eggs and cooked, crumbled breakfast sausage. Taco calzone – Use cooked ground beef seasoned with taco seasoning, diced tomatoes, diced onions and cheddar instead of mozzarella and no sauce inside. Dip in sour cream. Hawaiian calzone – Use sliced ham and pineapple chunks. Use garlic butter to fill and dip. 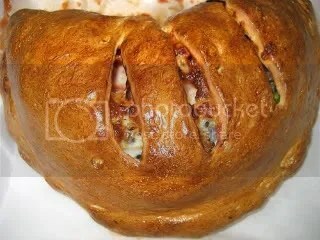 Barbeque calzone – Use shredded beef, onions and cheddar instead of mozzarella. Use barbeque sauce to fill and dip. Bacon cheeseburger calzone – Use cooked, crumbled ground beef and bacon. Use cheddar instead of mozzarella. Use blue cheese dressing to fill and dip.